During a period characterised by both prolonged recession and the increasing complexity of enterprises, informing and consulting with workers becomes all the more important. It is therefore not surprising that the European Commission of the EEC’s proposal in favour of a directive concerning such activities attracted attention and created controversy. As the controversy continued with no sign of abating, the Group for European Policy Studies (GEPE-SEP) broke new ground by placing the problem within a broader context. 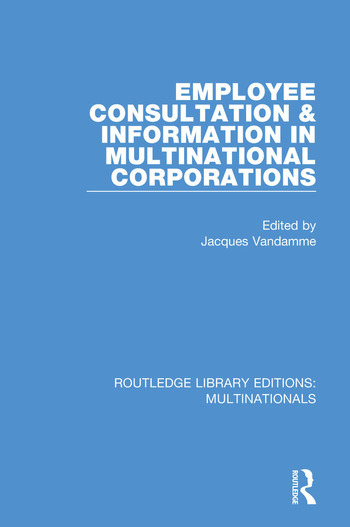 This title, first published in 1986, analyses the idea that the issue of informing and consulting with workers in multinational enterprises should best be examined within the context of the general economic and social evolution of the member countries and in relation to the national and international instruments and practices in place. The broader viewpoint allows a better grasp of the issues involved as well as of the advantages and problems in informing and consulting workers on various aspects of working life. This title will be of interest to students of business studies.